Two K-State interdisciplinary student teams are winners in the United States Environmental Protection Agency’s second annual Campus RainWorks Challenge. The two teams were chosen out of 84 student teams from 29 states who submitted green infrastructure designs for the challenge. The students developed the projects as part of a Fall 2013 landscape architecture Planting Design Studio. Associate Professor Lee Skabelund and Assistant Professor Jessica Canfield taught the course. The first prize winner in the Site Design Category, “Prairie Vision: Hale Library’s New Front Porch”, recommends redeveloping the more than 13,000-square-foot area south of Hale Library. 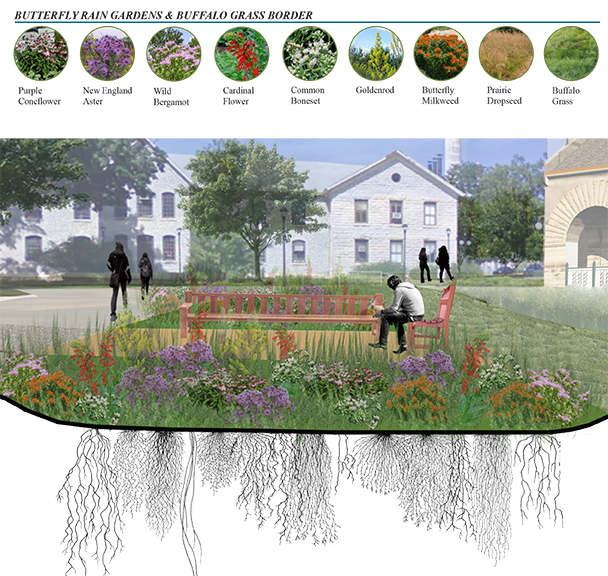 The project proposes a stormwater garden, filtration and infiltration systems, permeable paving, decreased lawn space, native plantings, shaded hardscape and wet meadow areas. 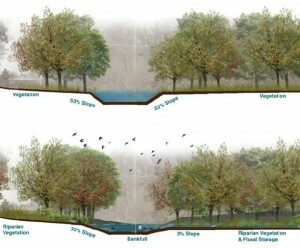 The designed system is expected to retain 100 percent of the stormwater from a one-year storm. The K-State honorable mention project, “Precipitating a Sustainable Sensibility: Solving a small problem to shift the paradigm of a big campus”, focuses on an area next to the Beach Museum of Art and the Hummel Family Meadow. The project uses a drainage channel, rain garden and cistern to manage stormwater and mitigate erosion. The designed system is expected to retain the stormwater from a 10-year storm. Landscape architecture students were recognized for outstanding contribution to landscape architecture at the American Society of Landscape Architects Central States Conference in Omaha, Nebraska in April. 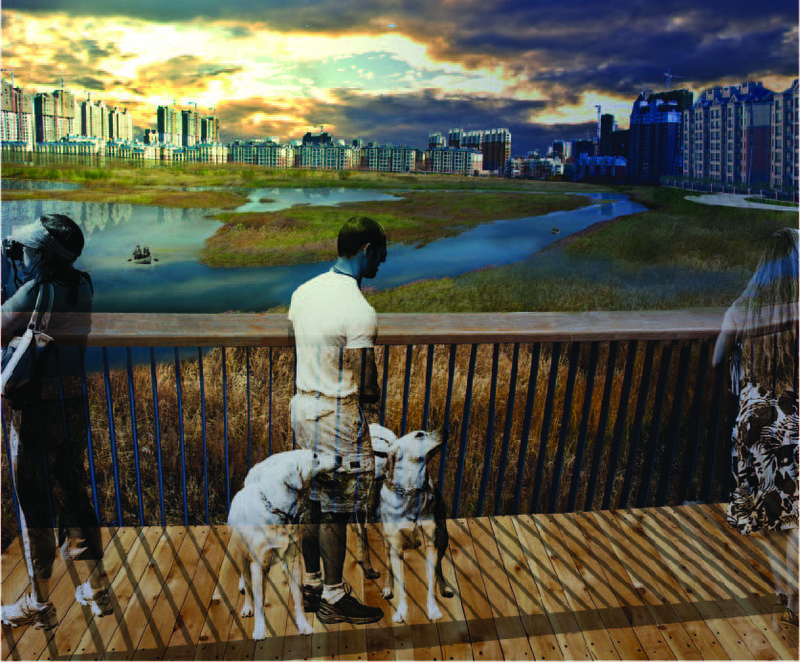 Natalie Martell, MLA ’13, Honor Award in the design-unbuilt category for “Productive Ground: 21st Century Design Strategies for Fairmont Park”. Major Professor, Jessica Canfield. Diane Cochiarra, Yue “Rebecca” Liu, Kraig Weber, Benjamin Williamson, MLA students, Honor Award in the planning and analysis category for the group project “Complex Catalysts: Resilient Urbanism for Eastern KCMO”. Associate Professors Blake Belanger and Howard Hahn. Anne Denney, MLA ’13, Merit Award in the planning and analysis category for “Redesigning River des Peres: To Improve, Protect and Maintain”. Major Professor, Tim Keane. Katie Burke, doctoral student in environmental design and planning; Taylor Allen, Wesley Moore, Parker Ruskamp, MLA students; Merit Award in the design-unbuilt category for the group project “The Rain Pocket”. Assistant Professor Jessica Canfield and Associate Professor Lee Skabelund. Lauren Heermann, Amanda Kline, Jared Sickmann, Benjamin Williamson, MLA students, Merit Award in the design-unbuilt category for the group project “Prairie Vision: Envisioning a Sustainable Model for Campus Stormwater Management”. Assistant Professor Jessica Canfield and Associate Professor Lee Skabelund. The American Society of Landscape Architects Central States region includes eight states and six chapters in North Dakota, South Dakota, Nebraska, Kansas, Iowa, Missouri, Oklahoma and Arkansas. Landscape architecture students were recognized with 2014 American Society of Landscape Architects Prairie Gateway Awards. 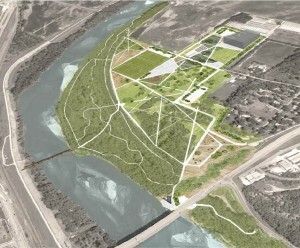 Anne Denney, MLA ’13, Planning and Analysis Merit Award for “Redesigning River des Peres: To Improve, Protect and Maintain”. Major Professor, Tim Keane. The Prairie Gateway Chapter of The American Society of Landscape Architects (PGASLA) represents Kansas and Western Missouri. The “Planning and Pop Culture: Radio Special” took second place in the Entertainment Program division of the Kansas Association of Broadcaster’s student awards. The course was led by Associate Professor La Barbara Wigfall and Assistant Professors Kate Nesse and Huston Gibson. Professor Stephanie Rolley’s appointment as the department head of LARCP was renewed. Click here to read more. She received the Presidential Award for Excellence for Outstanding Department Head from President Schulz and Provost Mason on May 7. LARCP professors Jason Brody (RCP), Howard Hahn (LA), Jon Hunt (LA) and Katie Kingery-Page (LA) received tenure and promotion to associate professor. Professor Tim Keane (LA) received a Professorial Performance Award recognizing his teaching, service and research activity since his promotion to Professor. Assistant Professor Anne Beamish (LA) received certification as a member of the Ph.D. faculty in APDesign. Staff landscape architect Dea Brokesh received the APDesign Classified Employee of the Year Award at the Classified Employees Awards on April 30. Academic Advisor Jayna Elsasser received an award from the Professional Development Fund offered by the President’s Commission on the Status of Woman to attend the National Academic Advising Association (NACADA) Annual Conference in Minneapolis, MN in October 2014. Assistant Professor Jessica Canfield (LA) received the 2014 Excellence in Design Studio Teaching Award at the CELA meeting. Associate Professor Blake Belanger (LA) and Assistant Professors Kevin Bernstein and Erin Wiersma (Art) received an Academic Excellence Award, $12,800, to purchase an industrial grade vacuum press. The press will be located in and maintained by APDesign. The Green without Greed team was in France from March 17 – March 28 to install Assistant Professor Jessica Canfield’s (LA) winning entry at the Domaine de Chaumont-sur-Loire International Garden Festival. For more information about the project and to view the team’s daily blog go to greenwithoutgreed.blogspot.com. Katie Kingery-Page (LA), La Barbara Wigfall (RCP) and Leah Edwards (MLA ’14) received a grant from K-State’s Center for Engagement & Community Development to support Leah’s MLA research project, “History, Identity, Art: Visually Expressing Nicodemus, KS’s Identity”. The grant is a continuation of CECD’s ongoing support for engaged work in Nicodemus, Kansas. Leah was advised by major professor Kingery-Page and committee members La Barbara Wigfall and Jon Hunt. Natalie Martell, MLA ’13, and Assistant Professor Jessica Canfield (LA) were short listed in the Slant Open International Landscape Design Competition 2013/2014 “Transition”. 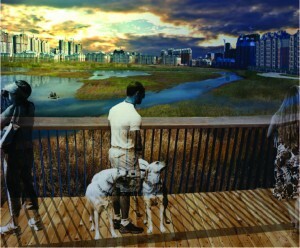 Their entry, Human Habitat, is one of 16 shortlisted out of 52 entries. They are one of six teams from the United States short listed. Professor Tim Keane (LA) and Assistant Professor Brent Chamberlain (LA) traveled to Washington DC to meet with representatives of the National Science Foundation and other agencies as part of a K-State Delegation.